FILE - U.S. Secretary for Defense, Jim Mattis. Just days after unveiling a new Pentagon strategy that prioritizes the U.S. geopolitical rivalry with China, Defense Secretary Jim Mattis is getting a chance to start implementing it. Mattis is in Jakarta, Indonesia, the first stop on a week-long trip that will also take him to Vietnam. Both countries are modernizing their militaries and have pushed back on China’s expansive territorial claims. On Friday, Mattis unveiled a National Defense Strategy that outlines a fresh attempt to redirect attention from terrorism toward what it termed “great power competition” with China and Russia. “What we’re looking for is a world where we solve problems and we don’t shred trust, we don’t militarize features in the middle of international waters, we don’t invade other countries, in Russia’s case,” Mattis told reporters on his flight to Jakarta. The Obama administration also tried to rebalance military and economic engagement toward the Pacific, ostensibly to respond to a more powerful and assertive China. But that shift was complicated by the rise of Islamic State and the continued threat from North Korea’s nuclear and ballistic missile programs and many of the same global challenges remain. North Korea will come up in his talks in Vietnam and Indonesia, Mattis acknowledged. Counterterrorism and Islamic State are also likely to be a focus in Indonesia, the world’s most populous Muslim country. The country must deal with the possible return of hundreds of Indonesians who fought with IS in Syria and Iraq. 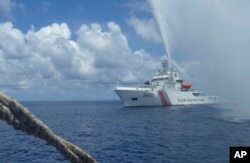 A major focus of the trip will be the South China Sea, where Beijing has built up military and other facilities, overriding the territorial claims of its smaller neighbors. “Small nations (should) get the same respect, the same regard, as larger nations. Every nation matters and there should not be any bullying or shredding of trust toward others,” Mattis said. “What we want out here [is] ... a peaceful, prosperous, and free Asia, with a free and open regional order defined by the rule of law,” he added. Vietnam is perhaps the most vocal opponent of China’s territorial claims. It has clashed repeatedly with Chinese boats in recent years. Though Indonesia has been less vocal and does not consider itself a claimant nation, it too has pushed back. Last year, Jakarta renamed a portion of the South China Sea, angering Beijing. “We applaud any country’s efforts to enforce its sovereignty and its exclusive economic zone and to fly, sail and operate wherever international law will allow them,” says Joseph Felter, the top U.S. defense official for Southeast Asia. FILE - Chinese Coast Guard members approach Filipino fishermen as they confront each other off Scarborough Shoal in the South China Sea, also called the West Philippine Sea, Sept. 23, 2015. The South China Sea has not made the headlines as much in the past year, thanks to a combination of factors: a new government in the Philippines appears less assertive about standing up to Beijing, the United States has focused on getting China’s cooperation in averting a major crisis in Korea, and there has been a slow-down in Chinese island-building – although that may be because Beijing has already finished construction, says Felter. “They’ve got a long-term strategy in the region, and we need to develop one to demonstrate our sincerity in being a credible partner and to give countries options,” Felter says. One option is reviving the Quadrilateral Security Dialogue, or "Quad", an informal alliance between the United States, India, Australia, and Japan formed in 2007. The arrangement quickly lost momentum, in part due to Chinese fears it was aimed at containing Beijing’s rise, but the group met in November for the first time since its creation, and some commentators have questioned whether something like an “Asian NATO” is in the works. The Quad hasn’t been a major focus, but that may be by design, says Vuving. “We must be willing to take the tough decisions in 2018 against unilateral ways to change the use of the global commons with rules-based freedom of navigation,” Harris added.